Fifa World Cup 2018 Fixtures, Starting Date, Teams, Venues List– FIFA World Cup is something which every football fan cherish and every player dream of playing. FIFA World Cup brings all the football fans together. The fan following is such because it promises us with entertainment. We all remember the previous edition of world cup where Germany sealed the deal in extra time to become the world champions. Here we are discussing all the details of upcoming 2018 FIFA World Cup. The dates for Schedule of 2018 Fifa world cup is announced but the draw for Groups is still to be taken place. The matches will be played from 14 June to 15 July 2017. 32 National teams will be entertained in this tournament to play 64 matches in 32 days. All the 32 games will be played at 12 Venues. Russia’s Capital will host the final of 2018 world cup on 15 July. The FIFA World Cup 2018 is still a few months away. The teams are yet to qualify, draws are yet to be announced, the theme song is yet to release. Many important announcements are yet to be done. So here we are sharing all the important dates which are important for every football fan. Total 11 cities & 12 stadiums will host the FIFA World Cup 2018 matches. The tournament will start and end at Luzhniki Stadium in Moscow. Luzhniki Stadium in Moscow is the biggest stadium in the Russia with a seating capacity of 81,000. Whereas the Yekaterinburg is the smallest in terms of seating capacity with a seating capacity of 35,000. In the section of Important dates, we shared all the important dates which are necessary for every football fan to know. The FIFA World Cup 2018 Schedule is not yet announced. The brackets have been announced but the teams are yet to get their slots in those eight groups. So we will have to wait till actual schedule is announced. The FIFA World Cup 2018 Fixtures will be announced on 1st December. So stay tuned to our blog as we will update you with all the important updates. FIFA World Cup is a world class event and teams from all over the world participate in the FIFA World Cup Qualifiers. Total 210 teams participate from six confederations. Out of them, only 32 make their presence in the main draw. Its too early days and we have found just three teams who have been granted a green signal for the main tournament. Russia: The hosts qualified when they won the chance to host the competition back in Dec 2010. The FIFA World Cup 2018 schedule is created in such a way that no league competition throughout the world is disrupted and all the best footballers in the world are able to represent their countries at the World Cup. 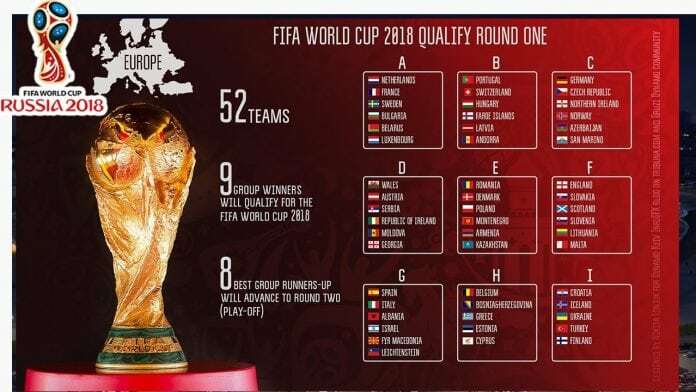 The Timetable for the FIFA 2018 tournament was released back on 24th July 2015, however, the complete set of FIFA 2018 Schedule was not being able to make as teams were still qualifying for the tournament. The complete set of fixtures will be announced in December 2017 when the actual draw for the world cup 2018 will take place. The FIFA World Cup 2018 Live Streaming Starting date has been already decided with the first match taking place on June 14th, 2018 where the Hosts Russia will be one of the participating teams. The tournament will conclude on July 15th, 2018 with the final to be held in Petersburg.